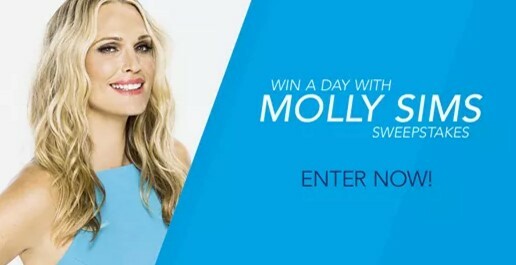 CoolSculpting wants you to enter daily for your chance to win a day out with model and actress Molly Sims in NYC for a day of beauty and CoolSculpting treatments worth almost $5000! Runner up winners will get signed copies of her book, too. Grand Prize: A three (3) day/two (2) night trip for winner and one (1) adult guest to New York, New York, from August 30 to September 1, 2016, to meet Molly Sims (“Grand Prize”). Grand Prize includes round-trip coach class air transportation from a major commercial airport near winner’s residence to New York, New York for winner and one (1) adult guest; two (2) nights hotel standard accommodations (single room/double occupancy); ground transportation between the airport and hotel; hair salon blowout with Molly Sims (location and details determined by Sponsor; subject to availability and Sponsor’s discretion); and one (1) CoolSculpting treatment (up to two  cycles) for winner near his/her hometown following completion of the Grand Prize trip (awarded in the form of a voucher). Note that if winner is not assessed as a candidate for CoolSculpting treatment (in Sponsor’s sole discretion), winner will receive a $1,000 check made payable to winner. The ARV of the Grand Prize is $4,925. Runner-Up Prizes (5): The runner-up prize is one (1) autographed copy of the most recent Molly Sims book, The Everyday Supermodel (“Runner-Up Prize”). Five (5) Runner-Up Prizes will be available in the Sweepstakes. The ARV of each Runner-Up Prize is $15. This Sweepstakes ends on 06/30/16 and you can ENTER DAILY to win.